At MDM Landscapes we are happy to help you with sod and grass installation in Dallas-Fort Worth, TX! Did you know mdm installs over 220 acres of sod a year? Professional and thorough, we have been in the business for several years and we are confident that we have the skills and knowledge to that you are looking for when it comes to the upkeep of your lawn. Call us at 817-396-0125. Sod consists of prepared grass and the soil beneath it and is held together with a layer of fibers or other material. It can be lain across a plot and provides nearly immediate grass that will establish itself and be ready for use as a lawn in short order. 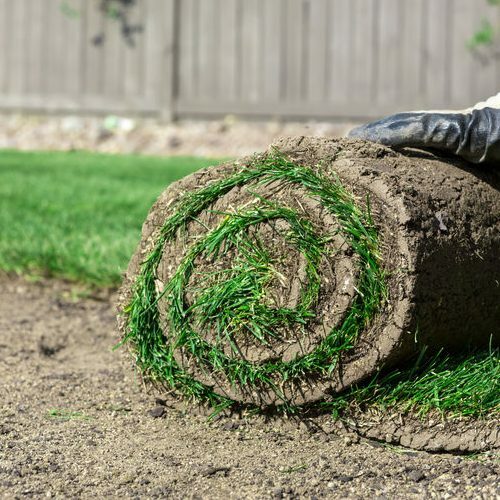 Whether laying new sod or repairing a patch of an existing lawn, it’s important to pay careful attention to how the sod is handled and installed. Sod is delivered in rolls or large sections that must be cut to fit as necessary, and pre-planning can save a lot of time and can avoid a potentially large mess. When you need sod and soil installation in DFW for your commercial property, apartment complex, or residential development, contact us. Measuring the area to be sodded will ensure you cut the right amount of sod. Sod is more expensive than seed, so care should be taken to avoid wasting sod whenever possible. It’s also important to ensure you have the right type of sod for your needs. Sod should be installed immediately, so it’s important to prepare ahead of time so once the sod arrives it can be laid. It’s important to irrigate ahead of any sod installation to ensure a proper level of moisture, and any pesticide or herbicide application should be done during this pre-installation phase as well. Pre-fertilization is also a great idea before sod and grass installation in Dallas-Fort Worth, TX, to help ensure the establishment of the root network happens quickly and without any troubles. We will ensure proper sod and grass installation, laying sod in straight lines following the curvature of any hardscape or other main features, ensuring edges are flush with one another and not overlapping. We will then thoroughly water your newly installed sod to allow the roots plenty of nourishment for growth. It’s important to allow the sod time to establish before any traffic or heavy use. It’s recommended to stay off the new sod for three weeks, including pets and children. This also helps ensure the lawn stays level and even. MDM Landscapes is the company you should contact when you are looking for reliable sod and grass installation in Dallas-Fort Worth, TX. You can reach us online or simply by dialing 817-396-0125 for this type of landscape service. Updated on March 27, 2019 at 2:13 pm by MDM Landscapes.